On a late winter we found a newly made Ootheca (mantid egg case) on a plant. There were two Parasitic Wasps (Podagrion sp.) trying to insert their eggs into the Ootheca. The two wasps are black in colour with body length about 5mm. They both had the very long ovipositor, more than three times of their body length. The two wasps flied away before we pointed our camera at them. Anyways, we took the Ootheca back home to see what would happen. About three weeks later, we saw many young mantids emerged from the Ootheca. They came out one by one, look like a small worm, 10mm long and pale brown in colour. They had the first moulting immediately outside the Ootheca. Then their appearance become exactly like their mother, except much smaller. In the about picture you can see many empty skin cases left after their moulting. Watch more carefully you can see one young mantid just emerging and few others still struggling in the moulting process. 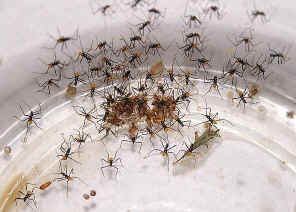 There were about a hundred of young mantids emerged. Some rested on the plant and some actively ran around. We did not see any cannibalism, could be they were not too hungry yet. After watching them for two days, seemed no more interesting things will happen, we put them back into our backyard. Beside the the emerged of the young mantids, we also see a few parasitic wasps came out. They came out by making a small hole on the side of the Ootheca. They look exactly as the two wasps that we mentioned above except none of them had the long ovipositor. We might see the male wasps emerged only. As their mothers, they flied away quickly and, again, we failed to take any picture of them. Female Hoppers lay eggs on tree trunks or leaves. The eggs are covered with a white waxy secretion produced by the ovipositing female. 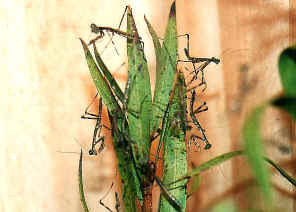 Nymphs are usually brown to dark brown in colour. Their habit are about the same as the adults. Like other members in the Hemiptera order, Planthoppers have their sucking mouth-parts to feed on host plants by sucking up the sap. 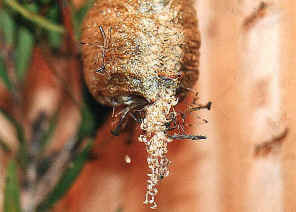 The hopper's eggs are also suffer the wasp parasite. 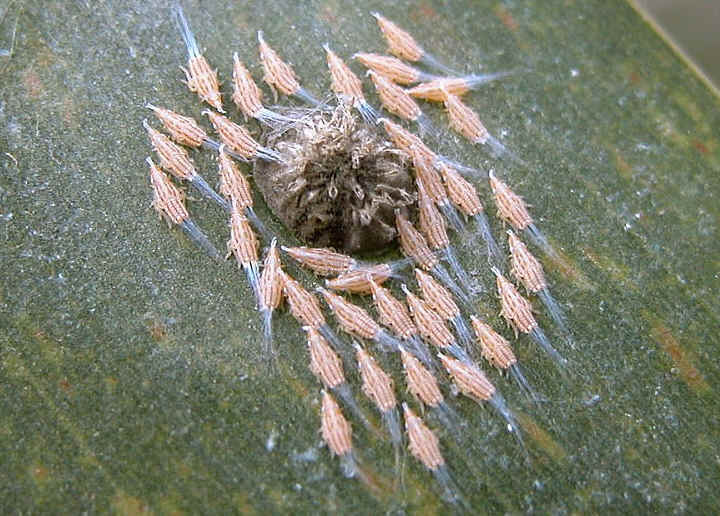 It is normal to see parasite wasps hatched from the Planthopper egg-plate. In late summer, we found a Common Assassin Bug and hoped that it is a female. We kept it in a large bottom and fed it with caterpillars. 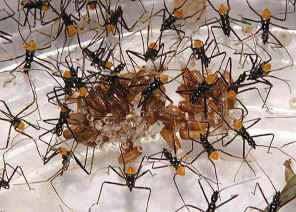 About a week later, the Assassin Bug laid a batch of eggs under the cover which we used to enclosed the bottom. The bug soon dead after laying those eggs. 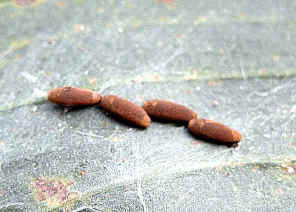 About two weeks later, many small bugs come out from those eggs. 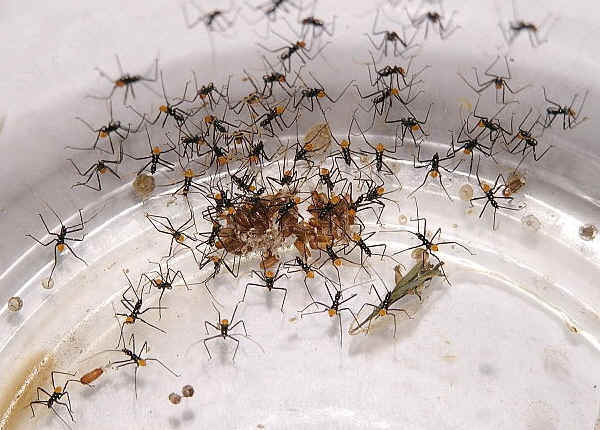 The small bugs look like black ants with orange abdomen. It would be hard to feed those small bugs. We put them back to our back into the field. Few weeks later in the early winter, we found this 2nd instars in the bush. We can see its strong mouth-parts well ready for hunting. The Glossy Shield Bug eggs are laid of 50 or more which are black in colour with short white spines around the rim. 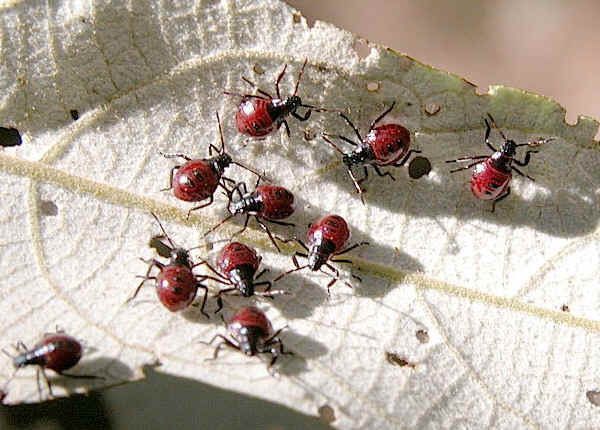 Young instars are bright red in colour. Later instars are dark red and brown. When bugs just hatched. They stay around their eggs cases. 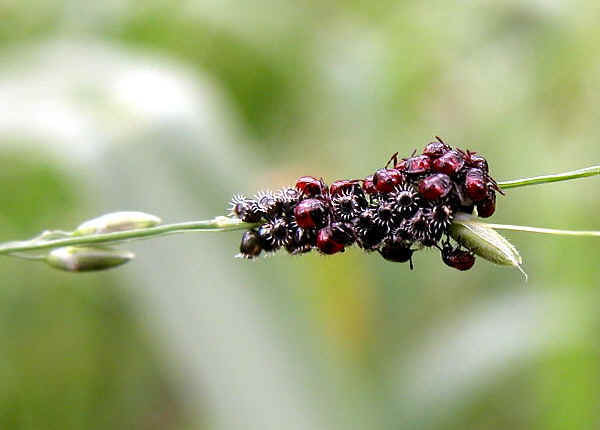 The1st instars nymph bugs feed on bacteria which the female deposited on the eggs when she laid them. 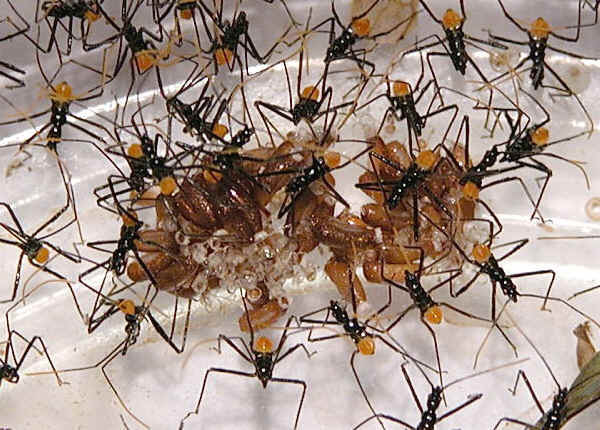 The bugs have to liquefy the food with saliva first before they can feed on it. 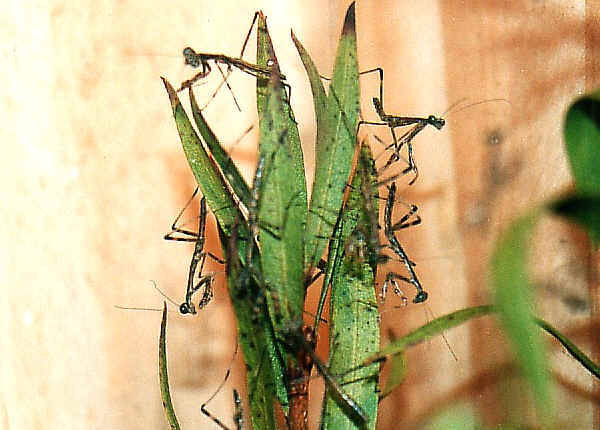 Although adults are essentially predaceous, first-instars nymphs feed on plant juices. 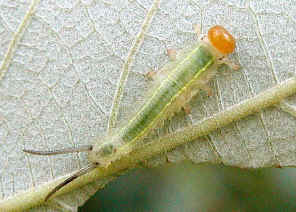 As their adults, the later instars are predators. 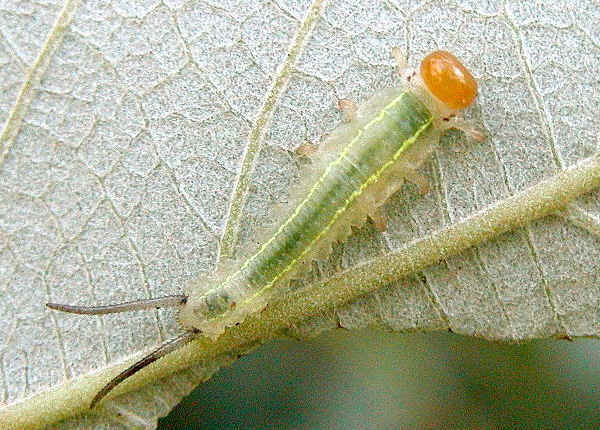 The feed on other soft body insects, such as the caterpillars. 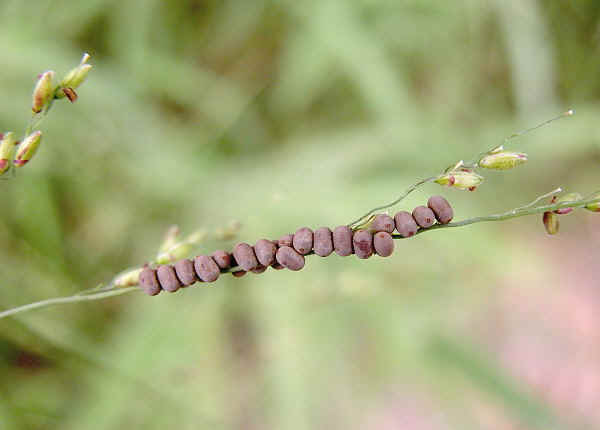 In mid-summer we found a cluster of eggs on grass seed stem. There were more than 30 eggs encircling the stem. We took them home and waited to see what would come out. A few days later, an Owlfly larva came out from each eggs. They stayed together on the empty egg shells motionless for one or two days. Then that started to move around. We put them back to where we found them. 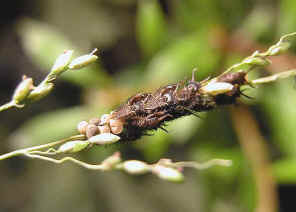 The Owlfly larvae are predators live in plant litter or on trees. On early summer, we found something look like insect eggs on an Acacia leaf, near them there was some Acacia Leaf Beetle adults. We believed they are their eggs. 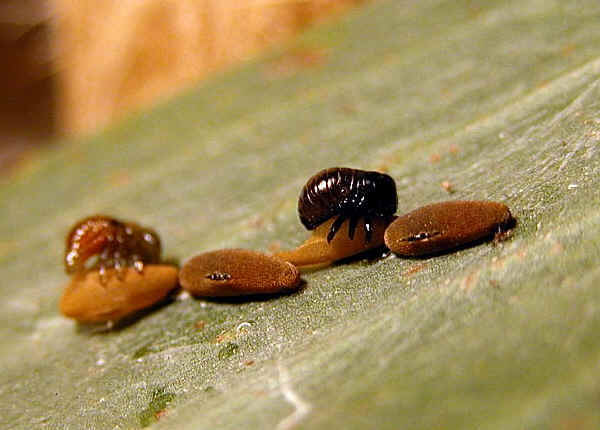 We brought them home and a week later, the eggs turned into three little beetle larvae, dark brown in colour, with the same body shape as the later instars. A week later, we found another batch of eggs on an Acacia leaf, the egg colour look a little bit different. We took them home, later in the evening, those eggs started to hatch as shown in the above picture. The dark larvae had came out a few minutes ago and starting to eat its egg case. The lighter brown colour one had just came out. Watch carefully, we can see the other two egg case were about to open. We found this group of sawfly larvae in early winter. They are pale green in colour with black head. 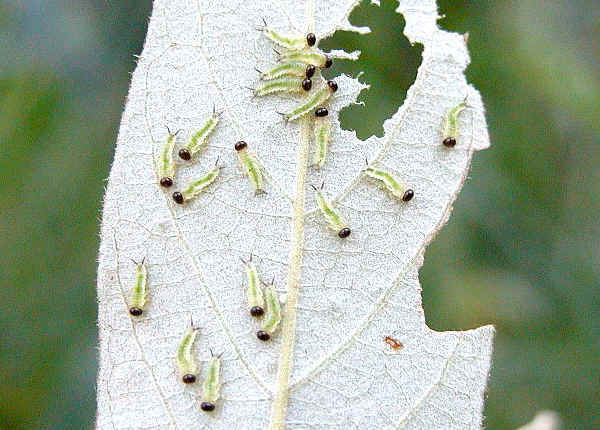 On another leaf of the same plant, there were some larger larvae feeding individually. Their head became pale orange in colour. There are two tails at the end of their abdomen. On the stem of the same plant, we found two adult sawflies. We believed they are the larvae's parents, although we was not sure if they are one male one female or both females. The adults were pale brown in colour with long antenna. However, the two sawflies were very weak and slow moving if they are not dying. When interrupted, they crawled slowly on the stem, but hardly can fly. Some species of sawfly are known will stand guard their eggs and young larvae. They may be the sawfly parents about to finish their duty of guarding their babies.